"Illinois, County Marriages, 1810-1934," database, FamilySearch (https://familysearch.org/ark:/61903/1:1:KFL5-D43 : 3 March 2016), Charles A Winship and Mary A Galliger, 23 Feb 1880; citing Kankakee, Illinois, United States, county offices, Illinois; FHL microfilm 1,839,993. "Massachusetts Births, 1841-1915", database with images, FamilySearch (https://familysearch.org/ark:/61903/1:1:FXZQ-MP7 : 1 March 2016), Charles N. Winship, 1863. Charles Hudson, History of the Town of Lexington, Middlesex County, Massachusetts, , at https://books.google.com/books?id=BEEOAAAAIAAJ . Boston and New York: Houghton Mifflin Co., (1913) , p. 769. Thomas W. Baldwin, Vital Records of Cambridge, Massachusetts, to the year 1850, Boston: Wright & Potter Print. Co., (1914) , Vol. 2, p. 610. "United States Census, 1870," database with images, FamilySearch (https://familysearch.org/ark:/61903/1:1:MFF7-C7R : 17 October 2014), John Winship, Rhode Island, United States; citing p. 116, family 875, NARA microfilm publication M593 (Washington D.C.: National Archives and Records Administration, n.d.); FHL microfilm 552,974. 1810 United States. Census Office. 3rd census, Population schedules of the third census of the United States, 1810, Washington, District of Columbia: National Archives. Central Plains Region, (1958-1961) , refer to census page 563. 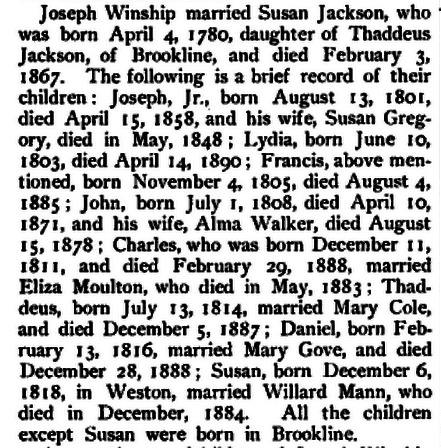 "Rhode Island Deaths and Burials, 1802-1950," database, FamilySearch (https://familysearch.org/ark:/61903/1:1:F8DJ-2MH : 6 December 2014), Susan Jackson Jones, 06 Dec 1901; citing Providence, Rhode Island, United States, reference p 96 n 209; FHL microfilm 1,906,587.